Well dressing involves the decoration of springs and wells with pictures made from living plants and flowers, and usually happens in the summer and early autumn. First you need a wooden board. Typically boards are around 4 feet wide, and over an inch deep. Some dressings take several boards, of different shapes and sizes. The board(s) are taken to the local river or pond and soaked for several days to ensure that they are really wet. The soaking is necessary because if wet clay is applied to a dry board, the boards will swell and the clay will crack. Then they are covered with a layer of soft, wet clay onto which the artist etches the design. Traditionally, clay is ‘puddled’ by putting it in an old tin bath or tank and working it with hands or feet until it is smooth and the right consistency. What makes just the right consistency is one of those matters of experience. Too wet and the clay will fall off the boards. Too dry and it will not properly hold the materials for the picture. 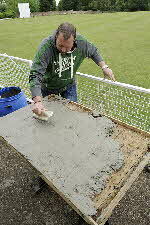 To help the clay to adhere, the board may have drilled holes or may be studded with nails or pegs. The outline is the first thing to be done, followed by the 'colouring in'. The materials used vary from village to village and depend also on the time of year that the dressing takes place. For instance, a village that dresses it's well in May may use blossoms and flowers whereas later in the year, seeds and berries are used as these are more plentiful.